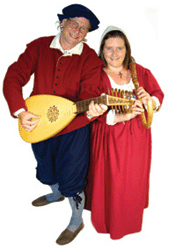 Specialising in medieval and renaissance music, the Medieval Minstrels perform in both contemporary and authentic period costume and play between them over 40 different early instruments. The Medieval Minstrels can provide both instrumental and vocal music, from a duo to a nine-piece group.They pride themselves on their professionalism and reliability whatever the event, and this is why so many major organizations have relied on them to provide the very best in entertainment. From a small conference banquet to a full medieval or Elizabethan themed event they have many years experience in providing the best in entertainment. They provide not only music, but also can supply entertainers who can provide juggling, jesting, fire eating, knights on horse back, falconers, fight re-enactors, archers…. Their work with Dr David Starkey, The British Museum, The National Maritime Museum and The Fitzwilliam Museum, along with many other centres of culture, has given them the experience to not only play but to talk informatively to the general public. They can provide scene setting music, fanfares, dance demonstrations, instrument workshops, talks on early music along with a wealth of knowledge about their particular musical period. “Thanks for making our wedding so special and remarkable, many people have commented to us how much they enjoyed your contribution . . . it certainly added a lot to our day.” Chris Chapel, Wedding at Innkeepers Hall, City Of London. “Thank you so much for your wonderful music. Your beautiful melodies certainly added much to the atmosphere of relaxed enjoyment.” Fran Andel, Lakeside Birthday Party, Bedfordshire. “A vibrant and polished performance of medieval music with an astonishing array of early instruments – both informative and very entertaining.” Felicity Devonshire, St Lawrence’s Centre, Christmas concert. “Your music was splendid !” Dr David Starkey, Elizabeth I Exhibition, National Maritime Museum, Greenwich.